Trade12 specializes in providing a fast, simple and safe way to learn Forex trading. We offer a wide range of trading services and opportunities so every trader has a chance to maximize their dollars. It’s with the latest technological advancements Trade12 is able to make trading from home a reality. This is something that couldn’t even be considered 30 years ago, but technology now makes it easy to trade from anywhere in the world. It got our experts thinking. What do the next 30 years have in store? While no one holds a crystal ball, let’s take a look at ways in which the world of Forex trading and trading at large may evolve over the years. Artificial Intelligence Will Play a Larger Role – Anyone with the latest iPhone can explain just how awesome it is to have Siri as a personal assistant. We often talk about how important having the latest information is when it comes to Forex trading. Our experts believe that over the next few decades, artificial intelligence on our phones will begin to offer a much deeper knowledge base in the trade markets. We expect this AI to learn what types of deals you like looking for and it will begin to offer suggestions. Crowd Sourcing Will Grow – The SEC has been investigating the legalities of crowdsourcing as a means to raise funds for businesses that are growing. Obviously, the high risk of fraud is at the top of the list of concerns. However, this is something that can be corrected in time. Our experts expect to see more businesses with great ideas take to the Web to grow their funds. The future may include more deals where larger companies support or sponsor the video in order to provide legitimacy for those who wish to invest. Dating Technology Will Become Trading Technology – Over the years, online dating has become more and more of a scientific endeavor. After users enter a list of likes and dislikes, algorithms help match them with likely mates. Our experts at Trade12 believe the same will soon be said of online trading. Imagine entering all of your investment likes and dislikes and then being alerted to opportunities that match your sensibilities. This will change the game the most when it comes to how quickly businesses are ready to raise capital. It will be easier than ever to get their idea in front of the right type of investor. 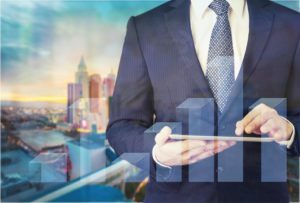 Stock Trading Jobs Will Shrink While Market Research Analyst Jobs Will Grow – It’s true technology has made the need for stock traders on the floor of Wall Street less and less relevant, but it will also help create jobs moving forward. With so much more information at one’s fingertips, it will be more important than ever to have an expert who can help interpret this information for corporations. Our experts expect there to become a huge demand for analysts who can work to compile information at a larger level for bigger businesses. Swings Will Happen Quicker – The biggest difference technology will make on the stock market is how quickly economic booms and busts can occur. Our experts expect that during the next few decades, investors will be subject to financial swings that last just minutes at a time. We take great pride on staying on top of the latest trends for our clients. Be sure to visit Trade12 often for the latest educational tools that can help provide you with every opportunity to be as successful as possible with your investments.